Sedition is the crime of revolting or inciting revolt against government. However, because of the broad protection of free speech under the first amendment, prosecutions for sedition are rare. 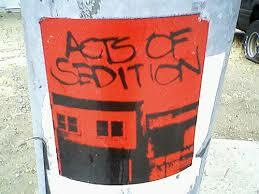 Sedition is an old word, that in my opinion, needs to be revived. The First Amendment guarantees that we, United States Citizens, have freedom of speech. It is a guarantee that I have hung my hat on many times in the past, and a right that under no circumstance can be denied. We must all feel that we have a right to express ourselves. Having offered all of the above, I believe, in my heart of hearts, that Charles Ellis “Chuck” Schumer stepped beyond the First Amendment and went against his oath of office during a NYC Rally against President Trump’s recent immigration order. Schumer, within his rights and oath of office, laid out his beliefs that the immigration order went against everything that America stood for. So far, he is within his First Amendment Rights and just barely within his Official Obligatatory Oath. However, he then pumped and riled the crowd to a frenzy, and at its peak, repeatedly pounded the podium, screeching and screaming, over and over again, “DUMP TRUMP, DUMP TRUMP, DUMP TRUMP”. By doing so, Schumer, in my opinion, overstepped his bounds, revoking his Constitutional Rights and invoked an ACT of SEDITION. We, law abiding, tax paying, well meaning United States Citizens, have heard so much of this type of oratory lately that we tend to shrug it off as “dissatisfaction and reaction by the losing opposition”. Well, enough is enough, for me at least. The President of the United States is the Constitutionally anointed leader of these United States, which Schumer, and others of his ilk, have Constitutionally sworn to defend, and to bear true faith and allegiance. “SEDITION”, I shout at the top of my register. Schumer needs, as a minimum to be censured and as a maximum removed from his Senate seat.